BHR Hollywood Reports.........VH1 recently rebooted its show “Celebrity Squares” and now branded it “Hip Hop Squares” and Safaree Samuels, T.I., and Lil Duval were on it. Footage from a deleted scenes landed online showing TIP clowning Safaree over his past relationship with Nicki Minaj. it all started when T.I. 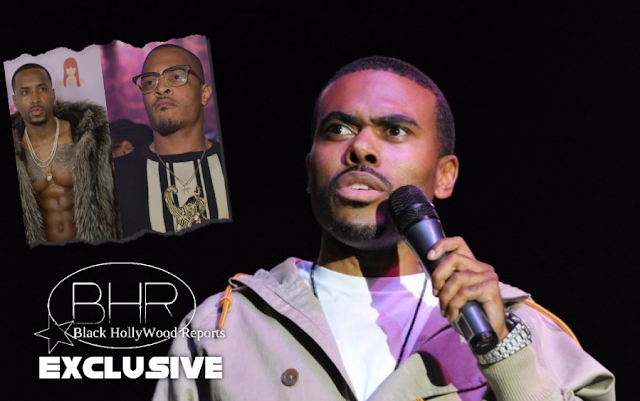 and fellow contestant Lil Duval starting making fun of Safaree's Love & Hip Hop gig, with T.I. saying, "He on 'Love & Hip Hop'? I thought his hip-hop love had went on. I ain't know he had a hip-hop love no mo'." Bringing up Nicki Minaj right off the bat? It was all downhill from there. Safaree fired back by asking T.I. if he needs help with his lyrics and, weirdly enough, telling Lil Duval to shut up because, "My d*ck is bigger than you."